Chuckwalla is guarded by a long approach yet is an awesome face route in the middle of beautiful and unique surroundings. The climbing is continuous, stiff, and runout by Red Rocks standards; it can be compared to well-protected face climbs in Tuolumne. Chuckwalla is intimidating, striking a nearly perfect straight line up a monolithic blank wall. With its newly replaced bolts and a rack requiring little pro other than nuts, it’s a stellar backcountry adventure. Which SuperTopo guidebooks include a topo for Chuckwalla? This route was originally called Chuckawalla 21 because there were 21 bolts and “chuckawalla” was the phonetic pronunciation of a local lizard. Two bolts have been added, and the spelling corrected, hence the name, Chuckwalla. George and Joanne Urioste initially spotted the formation while descending from the Velvet Wall, one canyon north. Joanne gave it the name Global Peak because, “Well, it was round.” Impressed with the route potential, they worked their way back into the canyon in May 1978. They climbed the nearby route, Sidewinder, which was, of course, named after another desert creature. But the Uriostes were mainly attracted to the line of Chuckwalla, even though it would require bolt protection on some blank face climbing sections. They made plans to return and work on the new route. Meanwhile, Joe Herbst also had his eye on the formation, which he intended to name “The Spirit Kiln.” He picked out a line and was planning to scout it, but had not yet gotten around to checking it out. The area was so remote that he felt no rush. In fact, he felt mild pride at simply having spotted the route potential in this inaccessible canyon. 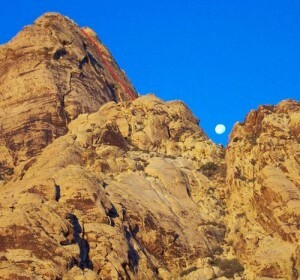 He was taken by surprise when the Uriostes invited him to come along on the Chuckwalla first ascent. Although Joe’s initial reaction was a disappointed, “Doggone!” he was impressed with the Uriostes’ line, which he considered better than his own idea. Beyond that, it brought him to the realization that George and Joanne had the ability and willingness to put up excellent new routes. The route went well. Even though Joe viewed bolts with skepticism, he could not help but be impressed that George placed all 21, drilling by hand, in one day.